For the record, our farthest, indoor distance with an Elite dart-based blaster to-date is 62 feet. And our furthest distance with a Vortex blaster to-date is 71 feet. So right out of the gate, we knew we had sometime special on our hands. But it didn’t stop there. If the Revonix had only produced solid distance shots, we would still be impressed, but not blown away. However, the Revonix also produced a phenomenal—and endlessly repeatable—3 shots-per-second rate of fire. We were able to dump the entire 30-round drum in only 10 seconds using the “Slam-fire” mode. And, unlike with the Elite, dart-based blasters, none of the shots were “duds” that left the barrel limp and spiraling. But the Revonix isn’t done yet. Another trick it has up its proverbial sleeve is a clever loading disc system that allows the user to spin the loading drum freely and load any of the five, 6-disc chambers on-the-fly from behind (facing the user), all without having to drop the drum, insert a clip, load from the front, or any other shenanigans. It’s easy, it’s fast, and it’s freaking brilliant. So what’s the downside? Well, there is one… and it’s a doozy. In order to allow for the Revonix’s trick loading system, the rounds are moved from their vertical loading position into a horizontal one for firing, all inside the body of the blaster. This is done in one motion, along with the drum rotation, when the user pulls back the priming handle. It’s very complicated, very mechanical, and hella loud. We’re not knocking the engineering behind it—it’s actually rather brilliant—and we NEVER encountered a jam (unlike some reviewers, and also unlike the Diatron, which is also somewhat of a nutter in the Vortex line, and jams just by looking at it funny). Nonetheless, what bothers us is that all of these mechanical happenings make us wonder about the life of the blaster. And perhaps more importantly in the short-term, they create such a racket, using the blaster will wake-up anyone within a 50 foot radius. And we should also mention that the action itself is stiff and, well, mechanical. It’s almost as if you can feel springs and levers working as you pull the priming handle. Again, it all works, and works amazingly well. But it’s clamorous, complex, and we just wonder how long it will take until something goes wrong. 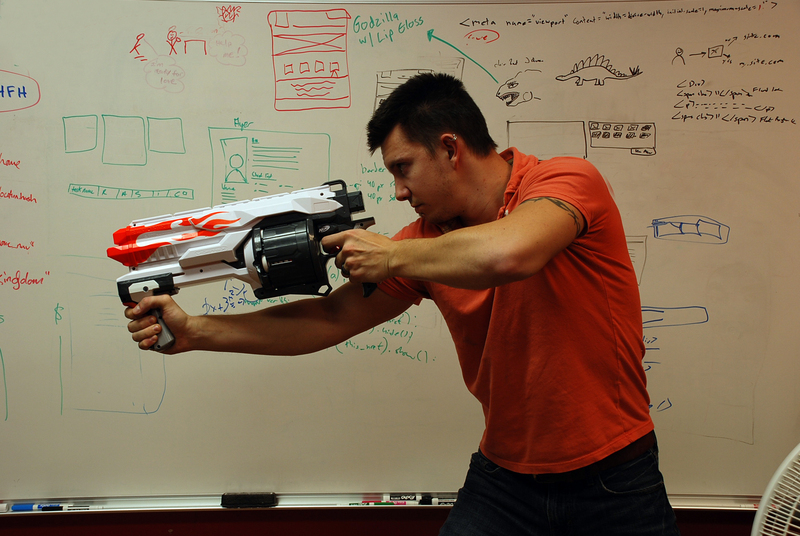 … if we were about to head into a firefight, we’d take be hard-pressed not to grab for the Revonix. It’s got distance, accuracy and ease-of-reloading that are hard to beat. And we must also discuss the elephant in the room… or, more accurately, the Pyragon in the room. 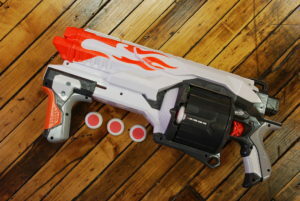 Up until the release of the Revonix 360, the Pyragon was basically the undisputed king of the Vortex line-up (the battery-powered Nitron having been released a year before the Pyragon, and never having gained much of a following). 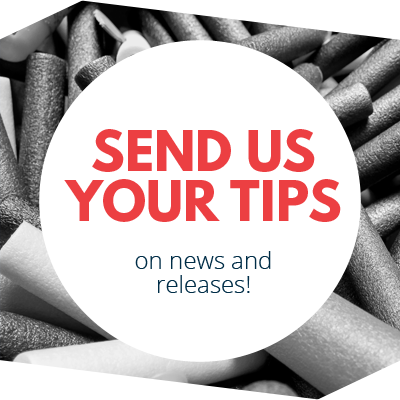 Indeed, the Pyragon and Revonix do share a number of similarities, including a sizable ammo drum (the Pyragon having a massive, 40 disc drum versus the Revonix’s smaller, built-in 30 disc drum), and a front-mount priming handle. They are also both capable of Slam-fire, and both are big and heavy. However, with the Pyragon and Revonix we had on-hand, at least, the Revonix simply out-performed the Pyragon in distance and accuracy. The Revonix was also MUCH easier to reload, essentially allowing the person wielding it to load as they fired. With the Pyragon, unless the user had a second drum or clip handy, the action stopped as soon as the 40 discs were unloaded (no adding discs on-the-fly). Now, in fairness, the Pyragon has a smoother action and isn’t nearly as loud and obnoxious as the Revonix. And we also wonder if the Pyragon won’t be more reliable in the long-run. But for now, if we were about to head into a firefight, we’d take be hard-pressed not to grab for the Revonix. It’s got distance, accuracy and ease-of-reloading that are hard to beat. So if we allow for the idea that the Revonix is at least the Pyragon’s equal, we are left to consider the Revonix on its own merits. And on that, we’ll simply say that, complexity and noise aside, the Revonix 360 exceeded our expectations. It continues to draw a crowd every time we use it, and it performs beyond the abilities of at least 90% of our other blasters. 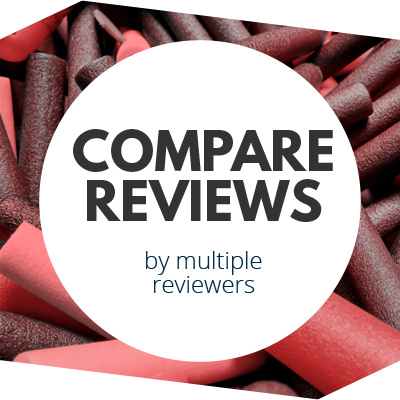 It’s still not the holy grail of foam-based blasters, but we’re nonetheless impressed with its engineering, performance, and reliability (at least, so far). In fact, given what it does—and especially how it does it—we’d darn near call the Revonix 360 revolutionary. I always preferred the praxis to the pyragon. This looks and sounds like a good gun though. I might buy it.